latency profiles and report about memory consumption. only 50% of the peak throughput. Is the lack of performance at higher block sizes normal? memory condition and messages like "Memory fail", "deflateInit failed"
stability and maturity of the embedded device either. cumulative and requires sustained loading of the file-system. Write test: 61.4s elapsed, 1218 blocks, 2.00 MB @ 33.4 Kbytes/sec written. Read test: 60.0s elapsed, 628782 blocks, 1.01 GB @ 17.2 Mbytes/sec read. 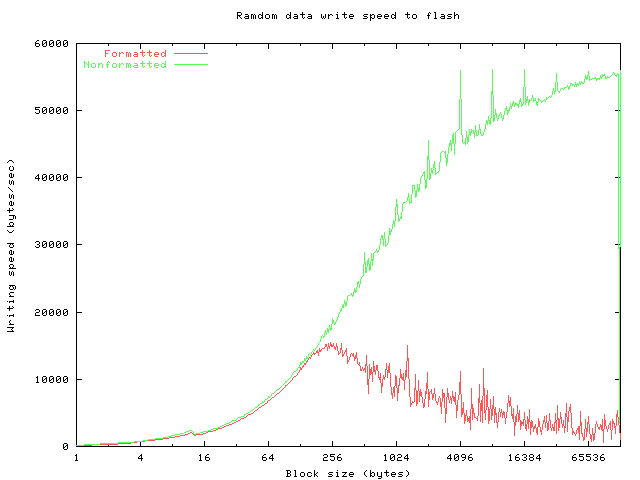 Write test: 61.5s elapsed, 821 blocks, 2.70 MB @ 44.9 Kbytes/sec written. Read test: 60.0s elapsed, 330471 blocks, 1.06 GB @ 18.1 Mbytes/sec read. 60.2s elapsed, 1086 blocks, 3.57 MB @ 60.7 Kbytes/sec copied. Write test: 60.8s elapsed, 1739 blocks, 6.79 MB @ 114 Kbytes/sec written. Read test: 60.0s elapsed, 19406 blocks, 75.8 MB @ 1.26 Mbytes/sec read. Out of Memory: Killed process 8 (sh). "\t 5 bytes available at begin before opening files\n"
"\t 6 bytes used at begin\n"
"\t 7 bytes buffered at begin\n"
"\t 8 bytes cached at begin\n"
"\t 9 bytes used after write test\n"
"\t10 bytes available after write test\n"
"\t11 bytes buffered after write test\n"
"\t12 bytes cached after write test\n"
"\t13 bytes used after read test\n"
"\t14 bytes available after read test\n"
"\t15 bytes buffered after read test\n"
"\t16 bytes cached after read test\n"
"\t17 bytes used after copy test\n"
"\t18 bytes available after copy test\n"
"\t19 bytes buffered after copy test\n"
"\t20 bytes cached after copy test\n"
"\t21 bytes used at the end after closing files\n"
"\t22 bytes available at the end\n"
"\t23 bytes buffered at the end\n"